A simple passive (no power required) circuit to match an antenna to a radio receiver. This will be a useful addition to the short wave listener, but in addition a medium wave coil is almost used to tune the medium wave band. An aerial tuning unit (A.T.U.) is a useful accessory for any radio listener as it matches the antennas resonant length to the received frequency, increasing gain and reducing spurious signals. The A.T.U. does not provide gain, but provides a better match between antenna and receiver, which usually gives an increase on the signal meter of the receiver, due to the A.T.U's resonant filter. The circuit is a standard Pi filter, consisting of two variable capacitors C1 and C2 and a multi tapped coil L1. Switch S1 is used to select the tapping points and C1 and C2 peak up on the received signal. 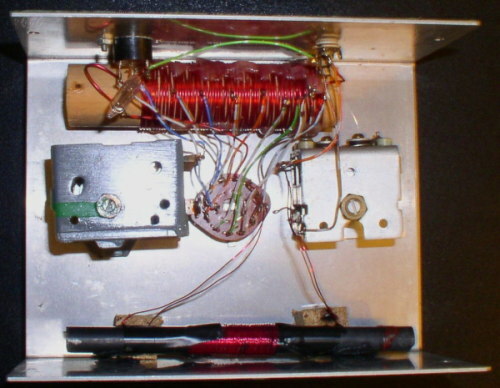 In this circuit an additional MW coil, L2 is used. This has a value around 200uH and can be salvaged from an old AM radio. In this position the A.T.U. can tune down to the medium waveband. To make L1, which is an air space inductor, use a 1 inch diameter former, a short section of an old brush handle made from wood is suitable. The coil is made from 22 swg enamel covered copper wire. The coil is tapped at 3,4,6,8,11,15,20,30,40,50 and 60 turns. Coil L2 is connected in series with the 60 turn tapping point. This is wound on a 3 inch length of 3/8 diameter ferrite and has 60 turns of 32 swg, or one can be salvaged from an old AM radio. Each tapping point is connected to the contacts on S1, to make this easier I used some small galvanised nails hammered into the wood former. Below is a picture of my A.T.U. In use this Antenna Tuner works best with a Long or Random wire antenna. As little as 5 metres of copper or aluminium wire suspended and insulated at each end in a garden will make an efficient antenna. The noise will also be lower than if using a receiver indoors. In use, the receiver is tuned to a frequency, S1 is turned for strongest signal and then C1 and C2 adjusted for best reception. For anyone wishing to make to make a long wire antenna here is a nice starting point.